Carlos Galindo: I worry about you all the time. Q: What film has 'A Better Life' been compared to? Watch it for Demián Bichir's Masterful Performance! 2 Days back, Demián Bichir earned himself an Oscar-Nomination for Best Actor in a Leading Role for 'A Better Life'. And that was it, I saw 'A Better Life' exactly 24-hours later since his nomination was announced. Demián Bichir delivers a Masterful Performance. A performance, that is so well-done, it come across as an astonishing embodiment. He elevates this film! 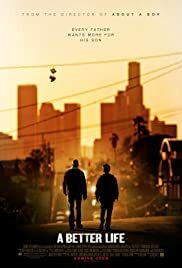 'A Better Life' Synopsis: A gardener in East L.A. struggles to keep his son away from gangs and immigration agents while trying to give his son the opportunities he never had. 'A Better Life', even as a film, is worth-seeing, thanks to the the moving screenplay, written by Eric Eason. The relationship between the Father & his Son, is wonderfully handled & written. Chris Weitz Directs this Human-Drama, with bravery. Cinematography is eye-filling. Editing & Art Design, are decent. On the whole, 'A Better Life' is well-made, but it's Demián Bichir's embodiment, that makes this film unmissable.